This page provides links to a variety of sources of reliable, verifiable information showing how the media influences and manipulate publics perception. Our most basic material is listed first, followed by other resources which delve deeper for those interested in more. We recommend reading through this entire page before exploring the links provided. 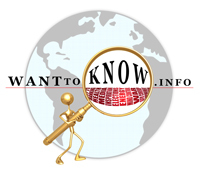 WantToKnow.info presents this information as an opportunity for you to educate yourself and others, and to inspire us to work together to strengthen democracy and build a brighter future for us all. For the best, most concise introduction to mass media manipulations, we highly recommend our media summaries. In these fact-filled summaries numerous award-winning journalists vividly describe their experiences of trying to report major news stories, only to have them systematically shut down by corporate media ownership. The stories include dangerous hormones in your milk, the shooting down of TWA Flight 800 by the military, thousands of POWs abandoned in Vietnam, CIA involvement in the narcotics trade, and lots more. These captivating stories will help you to understand how the many cover-ups mentioned on WantToKnow.info are suppressed, and how the mass media can significantly affect our understanding of what's happening in the world. The Power of Nightmares is a revealing BBC documentary that digs deep into the roots of the war on terror, only to find that much of the widespread fear in the post 9/11 world has been fabricated by those in power for their own interests and spread through the media. The intrepid BBC team presents highly informative interviews with top officials and experts in combating terrorism who raise serious questions about who is behind all of the media fear-mongering. This eye-opening documentary shows that, especially after 9/11, fear has been used in the media to manipulate the public into giving up civil liberties and turning over ever more power to elite groups with their own hidden agendas. The Power of Nightmares clearly demonstrates that the nightmare vision of a powerful, united terrorist organization waiting to strike our societies is largely an illusion. For all citizens who care about the future of our world, this is a must-watch video. Other videos are also quite revealing. At the first video link below, two courageous reporters describe how their key story on the dangers of hormones in milk was completely shut down by the corporate management at Fox News. The second link presents three videos revealing how news and reporting in the media is orchestrated on a much grander scale than most would imagine. A university research team specializes in covering the top news stories each year which were either ignored or downplayed by the mainstream media. Project Censored is team composed of nearly 200 university faculty, students, and community experts who annually review up to 1,000 news story submissions for coverage, content, reliability of sources, and national significance. The top 25 stories selected are submitted to a panel of judges who then rank them in order of importance. The results are published each year in an excellent book available for purchase at their website, amazon.com, and most major book stores. A concise summary of last year's revealing stories is available at the link below. Our mass media resource list contains one-paragraph summaries of the best books, videos, and websites we've found which provide reliable information on media manipulation of public perception. Ratings are given on both interest and reliability for each resource listed. Links are always provided for purchase or free viewing. We have collected many news articles from respected media sources which contain eye-opening information exposing various aspects of media cover-ups. Links are always provided to the original sources for verification. The first link contains one-paragraph excerpts from incredibly revealing news articles with the most important articles listed first. The second link provides the same article excerpts listed by order of date posted to WantToKnow.info, while the third lists them by the article date. The fourth link below contains a list of only headlines and links to some of the most important articles on media manipulations. Explore undeniable evidence that the CIA has poured hundreds of millions of dollars into manipulating the media around the world in order to support a hidden agenda. Documented evidence and U.S. Congressional testimony leave no doubt that public perception around the world is shaped and manipulated much more than you might imagine. A powerfully revealing online lesson brings together the best video, quotes, essays, and much more on the important topic of the media. Developed by individuals involved with WantToKnow.info, this dynamic two-hour lesson provides a greater context with which to understand not only the cover-ups and manipulations going on in the media industry, but how this directly affects our lives and world. This eye-opening lesson also gives ideas on what you can do to make a difference, and leaves you feeling a refreshing sense of hope for the future of our world. Pulitzer-Winning Journalist Resigns - "Profits: that's what it's all about now"
The Iraq War Editorial That Disappeared: Where are the WMDs? We have no doubt that by working together we can and will build a brighter future. When we step out of fear, secrecy, and polarization, we choose to join with the ever increasing numbers of people dedicated to working together for the good of all in our world. You can make a difference right now by sharing this revealing information with your family, friends, and colleagues. Click on the "share" link at the top or bottom of this or any page on this website to help spread this valuable information far and wide. To contact your political representatives and the media about this information, click here. All pages are also designed to print well so that you can easily copy and share the information given. If you would like to send a short email introducing powerful information on mass media manipulations, click on the link below. Together, we are making a difference. And thanks for caring!